Region of Mongolia. Mongolia. Aimag. Aimak. 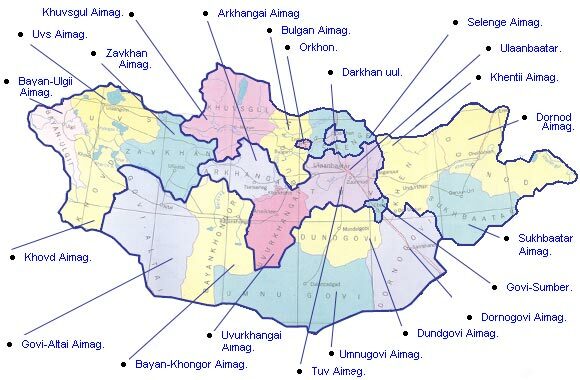 Mongolia is divided into a capital city and aimags (provinces), with further division of aimags into somons, somons into baghs, capital city into districts, and districts into horoo. There are 21 aimags plus 3 "city areas". These are Darkhan-Uul, Orkhon, and Govi-Sumber. The capital of Mongolia - Ulaanbaatar. The city areas - Darkhan uul, Govi-Sumber, Orkhon. Central Mongolia - Tuv, Uvurkhangai, Arkhangai. Northern Mongolia - Khuvsgul, Bulgan, Selenge. Eastern Mongolia - Khentii, Dornod, Sukhbaatar. Western Mongolia - Bayan-Ulgii, Khovd, Uvs, Zavkhan. The Gobi - Dundgovi, Umnugovi, Dornogovi, Bayan-Khongor, Gobi-Altai.